Inland Aquatics, combined with over 35 years of environmental expertise and green energy developments can provide the solutions needed in both the aquatic and green energy updates, addressing site specific needs. One of the main focuses has been in dealing with the mechanical control of aquatic vegetation through its management. Inland Aquatics works with Municipalities, Lake Associations, marinas and groups of cottage owners to improve lake living. 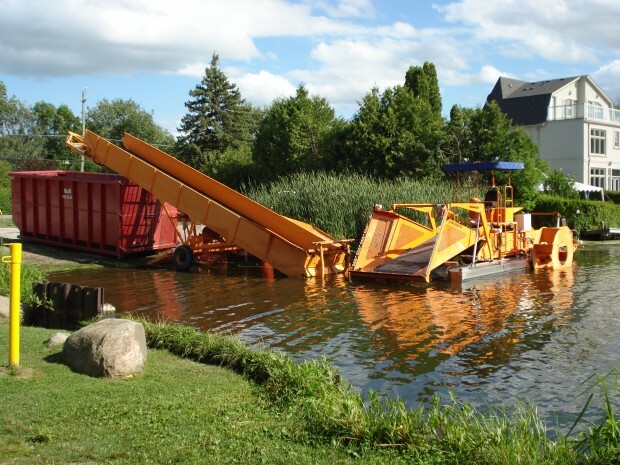 By using our aquatic weed harvesters and aquatic dredging equipment, we reduce hazards for boats and swimmers, as well as the daily beach clean-up of floating weeds created by boat propellers. We work with individuals to isolate the main concern be it lakefront, marina, pond, etc. Depending on your needs, we can address the site needs and budget available.